Like many inventions, Barnabas Helmy’s PUCK began with a problem. Helmy’s daughter, two years old at the time, ruined the remote control for their home’s Apple TV by chewing on it. “They’re expensive, and it’s not even that functional of a remote,” Helmy said, sharing a story he has told dozens of times over the past three years. Helmy recalls that when the bedroom TV remote broke, too, he decided to come up with his own solution. The result is PUCK, a small device which allows smartphone control of any TV, speaker or other machine which accepts an infrared signal. 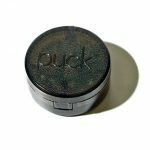 PUCK connects to a user’s smartphone via Bluetooth Low Energy technology, using an Android or iPhone app to translate commands into infrared messages other devices can understand. 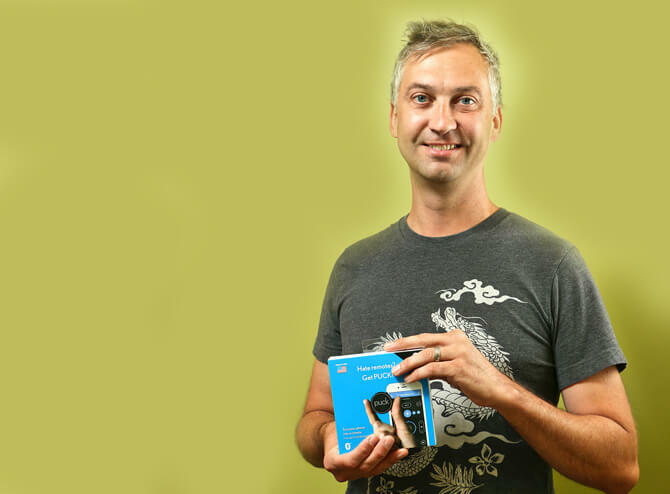 Rob Patino, a Springfield patent attorney and friend of Helmy, says that when Helmy showed him the concept for PUCK, he knew it could be “disruptive” to the existing marketplace. “I think that really encouraged him and motivated him to pursue the concept,” Patino said, adding that he believed so strongly in the idea that he’s one of the investors. Development of PUCK began in 2014, but Helmy’s path to today started much earlier. His interest in electronics began as a young man, when he would tinker with guitar peddles and eventually learn to build his own. Helmy originally studied electrical engineering in college, but he ultimately graduated from Illinois State University with a degree in oil painting. Despite the vast difference between those two fields, Helmy says having an understanding of the relationship between form and function laid the foundation for his current endeavor. “I’ve found that it has given me kind of an edge on other engineers because I have really strong design principles,” he said. Helmy built the first PUCK prototype over the course of one month in early 2014. In the three years that followed, he met again and again with engineers and designers to refine the prototype. Kevin Lust, director of the Small Business Development Center at Lincoln Land Community College, says his group met with Helmy several times to help develop a marketable business plan. Lust says the “prime directive” for groups like his is to avoid being a gatekeeper. In the case of PUCK, Lust knew Helmy would have to compete in a market filled with products which may not be the same, but which are similar enough to be confusing. With business plan in hand, Helmy visited Silicon Valley for a month, pitching PUCK three times a day to venture capitalists. All told, Helmy’s company, Smashtoast, Inc., raised about $500,000 in funding. “It’s taken this long just to get to market because of the amount of capital it takes to make something on a mass scale,” he said. says the Arch Grant was instrumental to Helmy’s success. “It really gave him a second wind when he needed it the most,” Patino said. Patino notes that the lag between concept and execution is one of the biggest challenges for a startup. “Sometimes realities don’t play well with your expectations,” he said. PUCK is manufactured at CCK Automations, an electronic circuit board maker in Jacksonville. Helmy says one benefit of keeping production local is better protection of his intellectual property. While overseas manufacturers may offer cheaper production runs, some have been accused of stealing designs to build competing products using the very same factories. In January, Helmy attended the Consumer Electronics Show (CES), a major yearly industry convention at which electronics companies typically unveil upcoming products. The CES trip led to calls from Walmart and several other retailers, and Helmy’s company reached an agreement with Walmart to sell the device in a few test markets. Helmy hopes to see PUCK sold in Springfield and across the country as early as Black Friday. If he had to start over, Helmy says Springfield would still be his base of operations. The low cost of living has helped keep development costs low, he says, and the Internet has made it possible to work with developers and engineers anywhere. Helmy hopes that other Springfield-area entrepreneurs are emboldened by his success. Lust says that while Springfield isn’t known as a tech hub – he only half-jokingly adds the qualifier “yet” – Helmy’s success so far serves as proof of what’s possible. Lust says a major factor in Helmy’s progress has been his attitude and adaptability. Patino adds that Springfield as a community could encourage other projects like Helmy’s by supporting “business incubators” like Innovate Springfield and by creating “investment angel” groups. Looking back on his journey and armed with new knowledge and experiences, Helmy says he could develop another product in a fraction of the time. In fact, he’s already working on his next big idea.